UNE hosts students and other visitors from all over Australia and the world. We all come from varied communities where we are used to doing things a certain way. When it comes to walking around town and campus, we should be mindful of how we need to use the roads and footpaths to keep safe. In Australia it is actually illegal if you do not take the most direct route when crossing a road. This is known as ‘jay-walking’. Do not walk out in front of a car - it will not stop! Cars have right of way. Never assume that an approaching vehicle can see you, or will stop for you – wait until all vehicles have stopped before you step off the kerb. At intersections, check for turning vehicles before you leave the kerb, and while you are crossing the road. Look before you cross. Just because someone else decides to cross, doesn’t mean it’s safe for you. Unplug your earphones and put away your phone so you are not distracted. 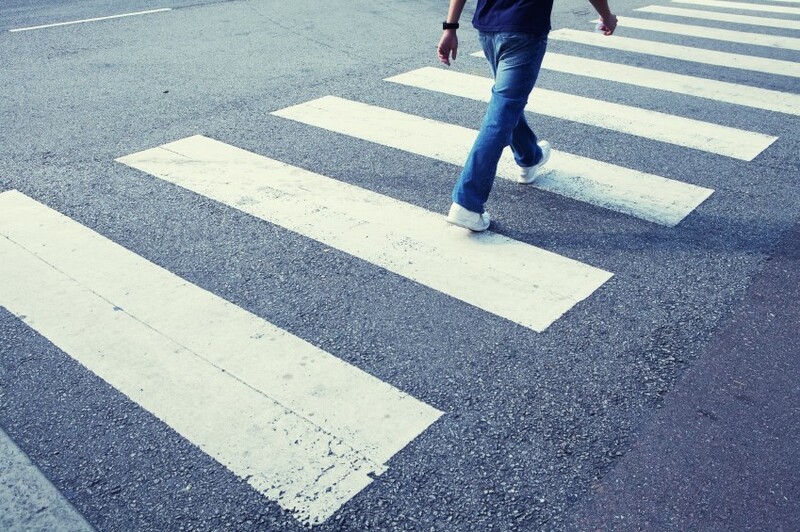 Always use pedestrian crossings if they are available. They are white or yellow stripes, like the picture below. At traffic lights, don’t enter the road if vehicles are moving through the crossing, or if the red ‘don’t walk’ signal shows. When walking near roads always use the footpath. If there is no footpath walk on the side of the road where you can see the oncoming cars and stay as far off the road as you can. UNE Work Health and Safety (WHS) Team: whs@une.edu.au and 6773 4269. For a 'poster' version please click here.